It is! It felt like as if I have an avenue to express myself. I think it is a good exercise for all. Afterall, it is a form of diary. Just that, instead of being private, it’s totally public. Some bloggers don’t really care, though, and all the expletives present themselves liberally. Many also had ramblings that do not make sense when viewed, but do when read aloud. One of the challenges of blogging or posting something on the Internet is the effort required to create the post. In my case, I have to prep the photos by first editing, then resizing, then watermarking. And for my case, my ‘ramblings’ have to be readable and understandable. Anyway, talking about photographic equipment. I made some major adjustments to my gear. I’m referring to the bags that carry the camera stuffs. After much contemplation, I decided to replace my Lowepro Sideline Shooter and recently-purchased Lens Case 4 with Off Road. Sideline Shooter has served my needs previously because it can comfortably fit a mounted camera with 80-200mm lens. I didn’t like the Toploader because it blocks the thigh movements. But eventually I found that I rarely keep the 80-200mm fixed permanently. So I reconfigured to fit 2 lens on the sides and a mount camera with a short zoom lens in the centre, in order for me to change lens quickly. It didn’t take long for me to realise that with this new configuration, I don’t need the Sideline Shooter, coz firstly it’s too big, and secondly, it’s kindda shallow, so with a mid-zoom or large WA lens, I cannot zip up. The beltpack also has very small storage space for other miscellaneous stuff like handphone, lens caps. 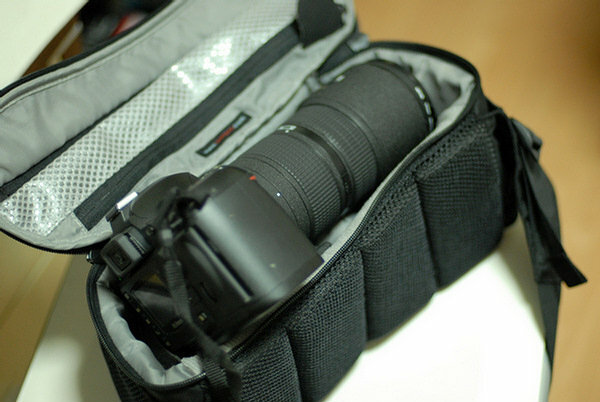 And to make it worse, I bought the Lens Case 4 to fit my 80-200mm, with the case hooked on the belt strap. It was a near-disaster when using it on one wedding assignment. The case is simply too huge, and without a real sliplock system on the Sideline Shooter, I looked like a fumbling clown than a professional photographer. Needless to say, I removed the case for the rest of the shoot. The Off Road is an obvious choice for me, because 1) it’s a beltpack, allowing me to swop lens quickly on-the-go; 2) it doubles as a shoulder sling bag, so I can carry the bag not on my waist; 3) it has a sliplock system that could secure the Lens Case 4. As usual, my photo kakis shared their views, mostly against the bag. I did have my doubts when I saw it myself during the Lowepro Open House, but I liked it for it’s depth and its large zip compartments. The 2 side lens cases looked small, but I got my Lens Case 4 anyway. My experience tells me that the best way to see if it works for me is to buy it back home and try it out. Anyway, if it didn’t work out, I could sell it. At home, I tried sliplocking the Lens Case 4 to the Off Road. Disaster! Putting the 80-200mm in the large case, the bag felt off-balance. My wife commented that I looked like a percussionist. And then I looked at the small lens cases that came with Off Road. I slipped the 80-200mm in it. And it fits! Well, almost. The rear cap protrudes out and the case couldn’t zip. Then I tried putting it in the main compartment. And it fits! I didn’t expect Off Road to be so deep. I also tried to fit my other lenses in the lens cases and they all fit in! I was pleasantly surprised! I really am! I felt that Off Road is the most satisfying buy I had in months! 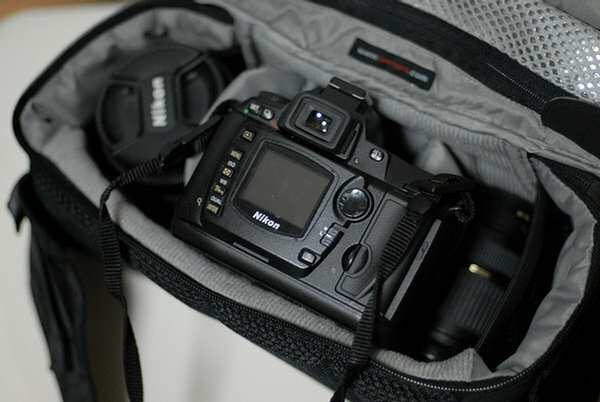 I managed to pack my 12-24mm, 28-75mm, 80-200mm, and D200 in all the compartments and the bag holds it all very well. These stuffs are what I brought to the ballet class to shoot the photos in my previous blog. The reason the Off Road lens cases can fit those big lenses. That’s because it’s made of softer material, whereas the other Lens Cases that sold separately are made of harder material, which, although protects the equipment better, restricts the expandability. So after all these trials, I decided that I’m better off without Lens Case 4. So I sold off my Sideline Shooter and Lens Case 4 today,and glad I did, coz they are taking up space on my storage box. Sorry I got no photos to illustrate my config for Off Road. Lazy lah. But for those people out there who is wondering this model, I’d say go for it! It’s much more useful that you think. In summary, I like it for its ability to carry it in more than one way, its deep compartments so that I can hold my 80-200mm, its deceiving lens cases that can fit lenses of 77mm thread, its generous zip pockets to store big items like handphone. Oh no, this post is sounding more and more like a typical review I would write on my Portal! Time to break away!